HOW ELSE COULD I HAVE BROUGHT YOU ALL TOGETHER? – PAPA BRIBES HIS KIDS TO MAKE THEIR WAY HOME..
A story about an Oldman waiting for his children to cheer up on Christmas. Caller on the phone – his daughter, reasoning out that she cannot make it for Christmas. Her kids saying “grandpa” with humble voices, as if they love to make it up with him all the time. He pretends to be not caring but his eyes speak out a hidden phrase. On Christmas, his home decorated with a Christmas tree, dinning lighted up with candles awaits the family from far, dressed in black. 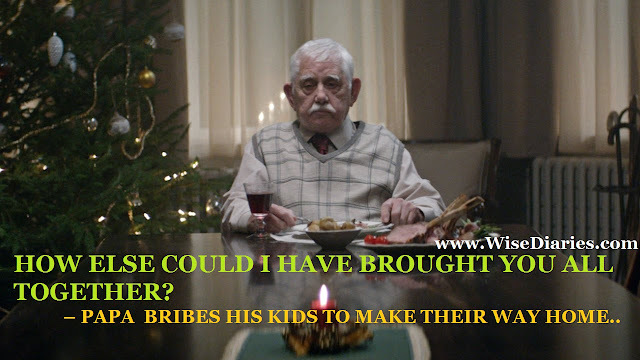 He bribes the children to visit his funeral instead of calling them over for dinner. Children, with all their difficulties they rush home. Surprisingly “Papa” home. Tears turn to joy. And his Christmas made them bunch up together and spend another family time. Our hearts are connected to each other, where absence of loved ones lead to loneliness. We grow up so soon and our parents grow old. It is all about a matter of time. When we dream bigger to build families and new homes our parents wish to live with us forever. The circular of this happening takes over from generation to generation. Family isn’t an ending story, it only packs up and grow. Worth is not to make way home for black dresses but to make over difficulties in good times. There are no second chances for loss of life, when god summons it is always the time. But make chances and priorities for the family’s good times, while we still live. Save this Christmas for thanking and forgiving the loved ones. May jingle bells ring over the doors of joy to you all. Merry Christmas!